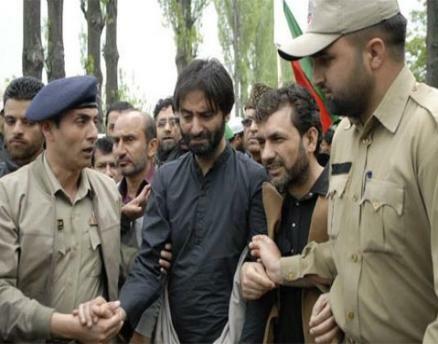 Srinagar : More than two dozen people were injured here on Friday as security forces and JKLF supporters clashed after their leader Yasin Malik was arrested during a protest march against reported moves to set up separate enclaves for Pandits in the Kashmir Valley. Police and the Central Reserve Police Force responded with batons and tear smoke shells after Jammu and Kashmir Liberation Front activists stoned them, police officials and witnesses said. Dozens of JKLF supporters led by Malik started a protest march earlier towards the city centre Lal Chowk from the adjacent Maisuma locality after the Friday prayers. When the marchers were near the Taj Hotel building, some distance away from Lal Chowk, police intercepted them and took Malik into preventive custody. This sparked off the violence. The JKLF had called for the protest march and a sit-in at Lal Chowk against the Jammu and Kashmir government''s plans to set up townships for migrant Pandits in the Kashmir Valley. Malik says such townships would further divide the Muslim and Hindu communities in the valley and create a Gaza like situation where Jewish settlers are supported by the Israeli state against the wishes of the people of Palestine. On Thursday, Jammu and Kashmir Chief Minister Mufti Muhammad Sayeed announced that there was no proposal to set up clusters for Pandits in the valley. He added that Pandits who fled the Kashmir Valley after the outbreak of separatist campaign in 1989 deserved a honourable return to their original native places. Despite Sayeed''s statement, Home Minister Rajnath Singh reiterated in New Delhi that "composite townships" would be set up in the valley for migrant Pandits. Sayeed''s People''s Democratic Party (PDP) and Rajnath Singh''s Bharatiya Janata Party (BJP) are part of an uneasy coalition that governs Jammu and Kashmir.